As we roll into 2017, I step outside of the EZVIZ “Mini Series” and onto the third camera from EZVIZ - the Husky. 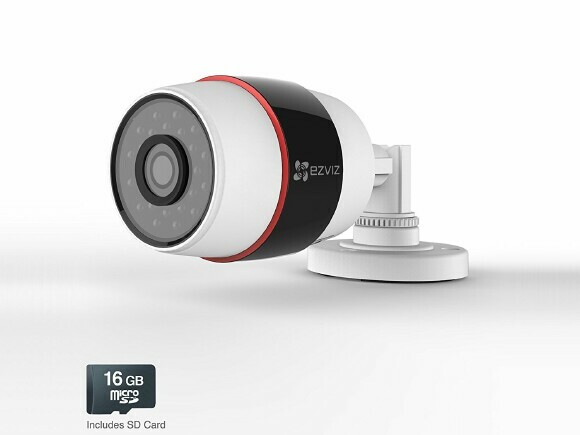 It's an outdoor 1080P bullet camera that can be used as a standalone or as part of a DVR system. The Husky is similar to most outdoor CCTV or traffic cameras (without the sun visor) with total dimensions of 6.81” x 3.29” x 2.75 and weight just shy of ¾ of a lb. The camera casing has an exterior color scheme of white with a black gloss ring around it. Along the bottom and hidden by a plate, are two philips screws as well as the included 16GB SD card, which is also where you'll find the detachable sticker with the barcode and verification code needed for setup. 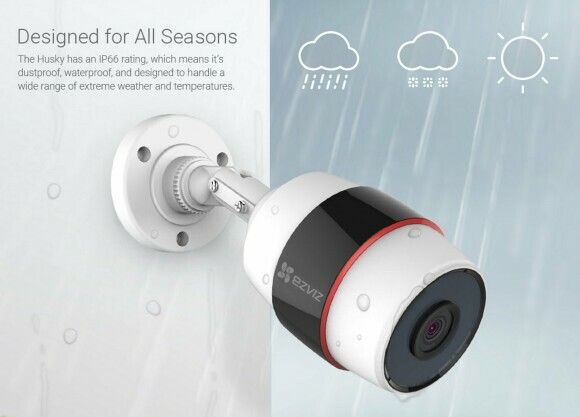 The camera lenses are surrounded by 24 IR-led which gives you a night time distance of about 70’ and a day time distance of 100.’ This is also enhanced by a wide-angle view of 107.5° at 30fps. The base is adjustable with all the materials needed to install outside but before you run off to get the ladder I’m going to recommend you take off the barcode and verification code sticker, place it somewhere safe, and file it away after setup. The camera is weather resistant but the sticker isn’t. Also while you have it in your hands, now would be a good time to consider upgrading your SD card which can max out at 128GB. EZVIZ gives you three options for data storage on all of its devices that you can either mix and match or use all three at once. First, of course, is the internal SD card, which is great for standalone app playback. But if the camera gets damaged you might lose the data. 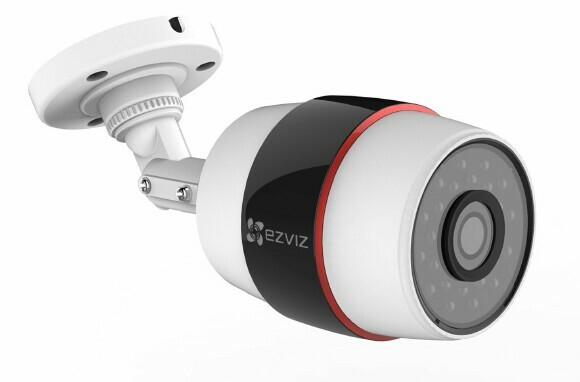 The Second option is the "EZVIZ Vault", a device that automatically connects to all EZVIZ cameras and saves all of the streaming videos on a 1TB HD. This is a great option for continuous recording or where large data storage is needed. The Third option is the "EZVIZ Cloud Service", which is an easy way to store and watch your videos safe and encrypted. I'd recommend this as it's a great way to protect against data loss if ever the camera or DVR is destroyed due to water or fire damage, taking with it important information. The cloud is free for seven days, which gives you a chance to become familiar with the service. After that, it then becomes a monthly paid subscription. You can add as many cameras as you like, as well as share or retain videos as needed. One neat feature included in the service is a "daily recap" as it will create a quick snippet of all the footage taken that day. For the most part, I'll touch upon the standalone, SD Card aspect via the app and the web-portal. Setting up the first time will most likely take you about ten min between getting the required info and setting up accounts. And as far as unique app features, I can’t tell you how good the time scale helps when looking at videos for particular events. I do own a DVR system and it was very easy to setup via Wi-Fi or Ethernet cable, but my DVR it’s comprised of spare parts and bubblegum. So giving it a full review on a non-EZVIZ DVR wouldn’t be fair since mine is quirky, to begin with. 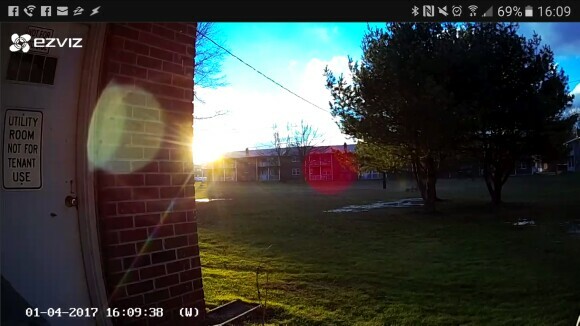 But I did luck out since I have a POE (Power Over Ethernet) set up with my DVR, so connecting the camera was honestly very simple. 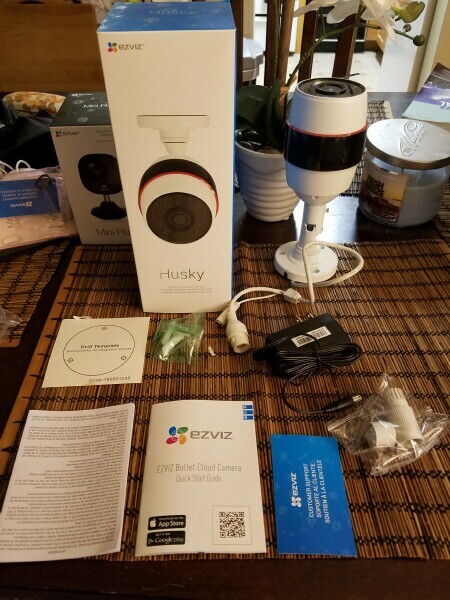 I have much love for the previous EZVIZ cameras I reviewed and both were pretty amazing. And now the Husky has entered my life and it's just as impressive, if not one-up from the previous cameras. The Husky works best if you want your garage or a large area (indoors or out) to be surveyed. And just like the previous cameras, The Husky is just as easy to setup and install, no matter where you want it placed. If you're familiar with POE connections, then using the Husky is a great way to connect to awkward or distant places. But, if POE isn’t your thing, just find an outlet and done. 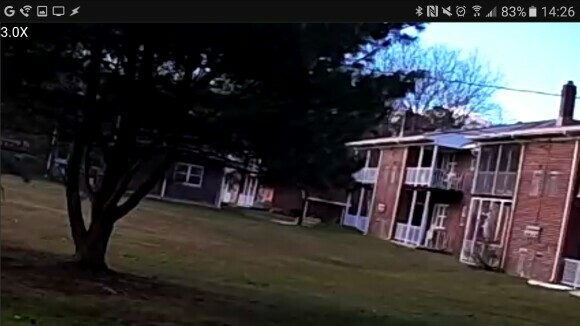 The smart detection, for me, has been working very well especially on a large scale as I can make it sensitive enough to watch deer walk by at a distance or only detect when larger objects are close, all at 1080P 30FPS. Even at night, I can’t ask for much more. During the day I really like how the adaptive lighting handled the sun when it was in direct view; basically, this means that means sneaky types can't use the sun as cover from the camera and sneak up to the house, as the Husky will adjust based on the sun's intensity. Finally, because it's mainly an outdoor camera, the Husky is weatherproofed against rain, wind, and snow. And with the winter forecast expected to be messy around these parts until spring, it's good to have a security camera that's prepared for the worse. The only suggestion I have about the Husky, is that I'd like to have the ability to paint the case and have it match its environment. From a business aspect, a camera is just a camera. But for my home, even though I want it to deter would-be thieves, it would be nice if it could match the house and not be so obvious. Now that I've finished with EZVIZ cameras, I have to say it’s been quite the experience that I wasn’t expecting to go so well. And as far as the Husky is concerned, I have to say it's an amazing piece of work, which offers easy setup, high-quality video, and it's weatherproof so it's built to last through the harshest conditions. 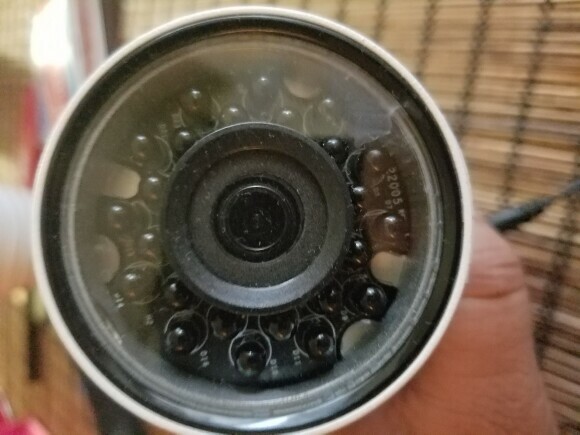 So, out of TOV 5 stars, I'm giving the EZVIZ Husky a perfect score of 5.